Texas, the Lone Star State, is a giant of a state. And Texans are known for their large, welcoming hearts. "Friendship" is the state's motto, and the people of Texas live by that motto. Texas is a state of superlatives. It leads the nation in total productivity. It is the leading oil producer in the nation. More beef is produced in Texas than in any other state. It is still the nation's largest cotton producer. Texas is a giant in the space industry, and is a major player in high technology. 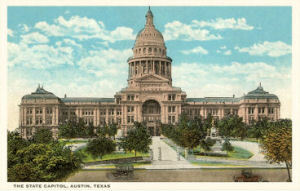 Fittingly, Texas also boasts the largest (gross square feet) of all the state capitol buildings, constructed of 15,000 carloads of pink granite. And no state has a greater variety of reptiles, or a more diverse selection of flowers, than the great state of Texas. 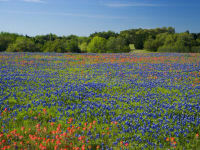 Among them the Horned Lizard (toad), the official state reptile and Bluebonnets, the official state flower. Find out more about these and other Texas symbols on NETSTATE's state symbol page. Texas comes from the word "teysha" meaning "hello friend" in the language of the Caddo Indian tribes. Spanish explorers and settlers used this word to refer to the friendly tribes throughout Louisiana, Oklahoma and Texas. Perhaps one of the most recognized nicknames of any state, "The Lone Star State" comes from the symbolism of the star on the 1836 flag of the republic, the "National Standard of Texas." The single golden star on a blue background signified Texas as an independent republic and was a reminder of the state's struggle for independence from Mexico. The "Lone Star" can be found on the Texas State Flag and on the Texas State Seal today. This nickname became the official nickname of the state when Governor Greg Abbott signed House Concurrent Resolution No. 78 on June 19. 2015. 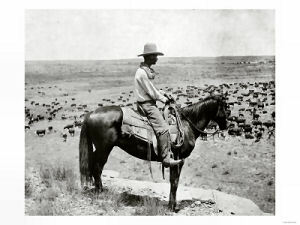 Perhaps more likely to be heard in connection with Nebraska, "The Beef State" is also one of the nicknames for Texas. This is attributed to the state's cattle ranching and beef production. This nickname signifies a leading position, a front-runner, and probably originated from Texas' political influence based on her large population. Charles Ledyard Norton wrote, in Political Americanisms (Longmans, Green and Company, New York and London, 1890), "The state, county, town or other political sub-division that give the largest vote for a party candidate is termed 'the banner state.'..." Other states have been referred to as "Banner States," but this nickname's connection with Texas seems to have been more lasting. Texas has been called "The Blizzard State" because of the frequent wind storms which sweep over the state. South Dakota is also referred to as "The Blizzard State." In 1882, P.T. Barnum brought the largest African elephant ever kept in captivity from London to the United States to be used in his circus. The elephant's name was Jumbo. The elephant came to signify anything that was unusually large. Texas, the largest state in the Union, became known as "The Jumbo State" at that time. The New Yorker Magazine called Texas "The Super-American State" in 1961. People who live in Texas or who come from Texas are referred to as Texans. Many years ago, in early Texas history, these same people were more likely to be referred to as Texians. The Texas quarter is the third quarter of 2004, and the 28th in the 50 State Quarters® Program. On December 29, 1845, Texas became the 28th state to be admitted into the Union. The quarter's reverse design incorporates an outline of the State with a star superimposed on the outline and the inscription, "The Lone Star State." The lariat encircling the design is symbolic of the cattle and cowboy history of Texas, as well as the frontier spirit that tamed the land. Texas comes from the Indian word "tejas," meaning friends or allies, and appropriately Texas's motto is "Friendship." Probably the two most recognized symbols of Texas are its unique shape and the lone star that is represented on the State flag. The Texas flag design was approved in 1839 to symbolize the Republic of Texas and was adopted as the State flag in 1845. The simple design of a lone star and three bold stripes of red, white and blue represent bravery, purity and loyalty, respectively. Texas is the only state to have had six different flags fly over its land -- Spain, France, Mexico, Republic of Texas, Confederate States of America and the United States of America. On August 14, 2000, Governor George W. Bush appointed the 15-member Texas Quarter Dollar Coin Design Advisory Committee. The Committee authorized the Texas Numismatic Association to conduct a statewide design contest on its behalf. Nearly 2,600 candidate design concepts were submitted in response to a statewide contest. From those design concepts, 17 finalists were selected by the Texas Numismatic Association and presented to the Texas Quarter Dollar Coin Design Advisory Committee for review. The Committee further narrowed the submissions to the five designs that were most representative and emblematic of the State. Governor Rick Perry submitted the preferred design of the outline of Texas beneath the Lone Star and encircled by a lariat, which was approved by the Secretary of the Treasury on August 26, 2003. Carpenter, Allan & Provorse, Carl. The World Almanac® of the U.S.A. . Mahwah, N.J.: World Almanac Books (An Imprint of K-III Reference Corporation, A K-III Communications Company), 1996. Texas (From Sea to Shining Sea) , by Alexandra Hanson-Harding. 80 pages. Publisher: Scholastic Library Publishing (February 2003) Reading level: Grades 3-5. Presents information about Texas's people, geography, history, landmarks, natural resources, government, state capitol, towns and cities, and more. Texas (World Almanac Library of the States) , by Rachel Barenblat. 48 pages. Gareth Stevens Publishing (January 1, 2002) Reading level: Grades 4-6. Filled with the most up-to-date information, including the latest Census results. Full-color photos bring to life the story of Texas. In addition to an in-depth factual profile of Texas in the form of a state Almanac, this book offers fascinating and lively discussions of the state's history, people, geography, government, economy, culture, and lifestyles. A section on Notable People, a calendar of events, and enough primary source documents, time lines, maps, and other tools to make this unquestionably the best young adult reference material on the USA available anywhere. With 295 color maps and 342 color photographs from every corner of the Lone Star State, the reader can take a trip across Texas from the comfort of one's own home. For the traveler, the myriad maps show the way to towns of all sizes, as well as to landmarks, lakes, rivers, parks and back roads. The Almanac's Counties section is one of the book's most popular, and the detailed county maps are continually updated when highways are made double-lane, towns are incorporated or un-incorporated, new highway loops are built, Farm-to-Market road designations are dropped, state parks are opened or closed, and changes are made in city limits and annexations. Gone to Texas: A History of the Lone Star State , by Randolph B. Campbell. 512 pages. Publisher: Oxford University Press, USA (August 7, 2003) Gone to Texas engagingly tells the story of the Lone Star State, from the arrival of humans in the Panhandle more than 10,000 years ago to the opening of the twenty-first century. Focusing on the state's successive waves of immigrants, the book offers an inclusive view of the vast array of Texans who, often in conflict with each other and always in a struggle with the land, created a history and an idea of Texas. Texas: A Compact History , by Archie P. McDonald. 254 pages. Publisher: State House/McWhiney Foundation Press (February 6, 2007) Texans' pride in their distinctiveness increases when their state is paraded--or satired--and they consciously "pass it on" to succeeding generations. But what does it mean to be a Texan? How did Texas come to be as it is? Texas: A Compact History provides answers to such questions about Texans and Texas. It tells the story of Texas history and provides thoughtful interpretations about the state's development, all with the general reader in mind--in a brief, easily read narrative. Lone Star: A History of Texas and the Texans , by T.R. Fehrenbach. 792 pages. Publisher: Da Capo Press (April 4, 2000) Here is an up-to-the-moment history of the Lone Star State, together with an insider's look at the people, politics, and events that have shaped Texas from the beginning right up to our days. Never before has the story been told with more vitality and immediacy. Fehrenbach re-creates the Texas saga from prehistory to the Spanish and French invasions to the heyday of the cotton and cattle empires. He dramatically describes the emergence of Texas as a republic, the vote for secession before the Civil War, and the state's readmission to the Union after the War. In the twentieth century oil would emerge as an important economic resource and social change would come. But Texas would remain unmistakably Texas, because Texans "have been made different by the crucible of history; they think and act in different ways, according to the history that shaped their hearts and minds."